The Bucerías Feria de Ostiones' (Oyster Festival) most anticipated event is always the 'Biggest Oyster' contest. Contestants go after 'The Big One,' and the diver that pulls the largest oyster out of the sea is awarded. Bucerías, Nayarit, Mexico - Playa El Punto is the place to be on Sunday, April 28, 2019, as Bucerías hosts the 19th edition of the Oyster Festival, an occasion created by the divers themselves for the coastal communities and their visitors. 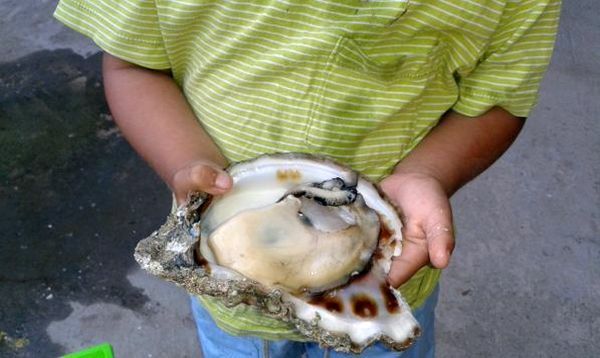 Since oyster harvesting is the mainstay of the economy in Bucerías (which means "Place of the Divers") Nayarit, every year after Easter this laid-back seaside community hosts the Feria de Ostiones (Oyster Festival) - a celebration filled with music, partying and plenty of food and fun. Organized by the Fishing and Aquaculture Cooperative for Costa de Chila, La Peñita and Boca Ameca, every year the hosts invite attendees to enjoy thousands of oysters, as well as hundreds of kilos of ceviche and fried fish - all free! - as a way to say "gracías" to the thousands of visitors who spent their Semana Santa vacation in Vallarta-Nayarit. In addition to all of that free food, there will also be cultural events, including live music, dance performances, the crowning of a new Oyster Queen, who will be selected based on audience applause to represent the divers; and many other surprises. "We want everyone to come because it's an event that showcases Bucerías' identity. It's also a great way to close out the holiday season," said David Elizondo, founder of the festival and part of the Organizing Committee. The Bucerías Feria de Ostiones began as a way to honor of the local oyster divers and, since the yearly event is on the last day of oyster-culling season on El Punto Beach, every year the most anticipated event is the 'Biggest Oyster' contest. Contestants go after 'The Big One,' and the diver that pulls the largest oyster out of the sea is awarded a statuette and a cash prize by event organizers. "They (the divers) have an oyster bank at El Punto and this event marks the close of the season for that particular bank, since they must protect the oysters for sustainability and to regulate its consumption; everything begins again in December," said Elizondo. This event is unique in the region and represents another fine attraction among the many already offered by 'Mexico's Pacific Treasure.' Make plans now to come out and enjoy the 19th Bucerías Oyster Festival - you'll be glad you did!